Pro Supps MyShake - 2 Lbs. (Graham Cracker, Snickerdoodle, Triple Chocolate Fudge) for $30.00 (Buy 1 Get 1 FREE) at Muscle and Strength! 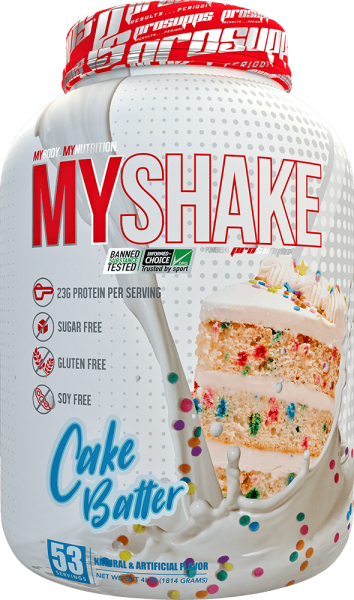 Another supplement in the popular ProSupps “My” series that’s a bit looser on the macros, this one has 5g carbs and 5g fat in each scoop, so huge flavor is expected. At $7.50/lb you’ll get 40g protein per dollar, and at $6.80/lb we fire up the email press since it’s 45g protein per dollar there. Price Per Unit to get on Deals Page: $7.50 per Lb. Price Per Unit to generate email blast: $6.80 per Lb. Pro Supps MyShake - 2 Lbs. (Graham Cracker, Triple Chocolate Fudge) for $30.00 (Buy 1 Get 1 FREE) at Muscle and Strength! Pro Supps MyShake - 2 Lbs. (Graham Cracker, Triple Chocolate Fudge) for $14.99 at Muscle and Strength! Pro Supps MyShake - 2 Lbs. (Graham Cracker) for $24.99 (Buy 1 Get 1 FREE) at Bodybuilding.com! Pro Supps MyShake - 2 Lbs. (Graham Cracker) for $30.00 (Buy 1 Get 1 FREE) at Muscle and Strength! Pro Supps MyShake - 2 Lbs. (Cake Batter, Graham Cracker, Triple Chocolate Fudge) for $30.00 (Buy 1 Get 1 FREE) at Muscle and Strength!